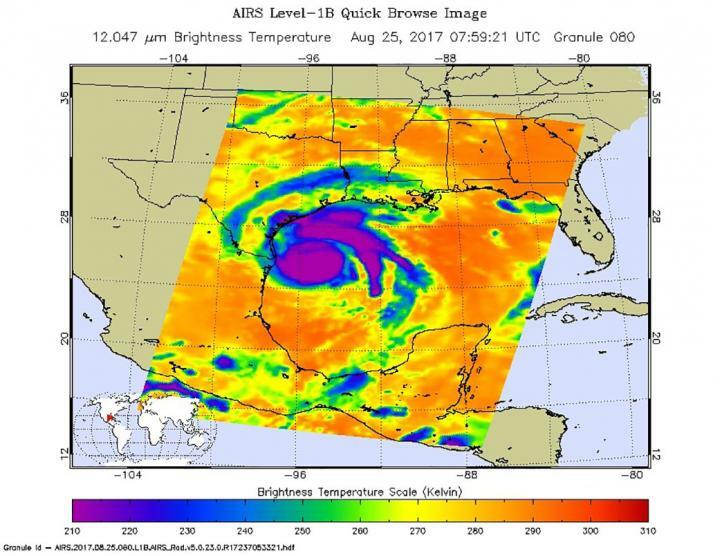 NASA's Aqua satellite passed over Tropical Storm Pakhar and gathered temperature data to determine the location of the most powerful storms within. Pakhar has triggered a number of warnings throughout the Philippines as the storm moves closer. Philippines warnings include Public storm warning signal #1 for the Luzon provinces of Cagayan including Babuyan group of islands, Apayao, Ilocos Norte, Nueva Ecija, Pangasinan, Northern Quezon including Polillo island, and Camarines Norte. Public storm warning signal #2 is in effect for the Luzon provinces of Isabela, Aurora, Quirino, Kalinga, Mountain Province, Ifugao, Ilocos Sur, Benguet, Abra, La Union and Nueva Vizcaya. On Aug. 25 at 1:41 a.m. EDT (0541 UTC) infrared data gathered from the Atmospheric Infrared Sounder or AIRS instrument that flies aboard NASA's Aqua satellite provided a look at the temperatures of Pakhar's clouds. In infrared imagery, the coldest cloud tops indicated a large area of towering thunderstorms high into the troposphere. The colder the clouds, the stronger the storms. AIRS data showed that some cloud tops were as cold as minus 63 degrees Fahrenheit or minus 53 degrees Celsius. Cloud top temperatures that cold have been shown to generate heavy rainfall. The data was false colored and made into an image at NASA's Jet Propulsion Laboratory in Pasadena, California to highlight cloud top temperatures. On August 25 at 11 a.m. EDT (1500 UTC) Tropical Storm Pakhar had maximum sustained winds near 40 knots (46 mph/74 kph). Pakhar was centered near 16.0 degrees north latitude and 122.2 degrees east longitude, about 109 nautical miles northeast of Manila, Philippines. Pakhar was moving to the west-northwest at 11 knots (12.6 mph/20.3 kph). The Joint Typhoon Warning Center expects Pakhar to strengthen slightly before passing over Luzon, northern Philippines, then move through the South China Sea to make a second landfall in southern China.